Finishing the trim and starting electrical brings Tiny Refuge another step closer to being lived in. Saturday we finished the rest of the trim. 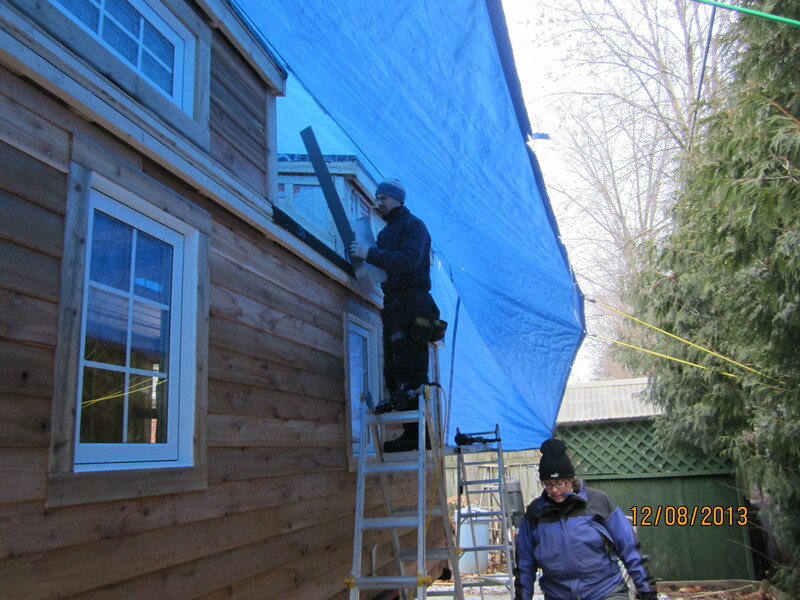 A word about the trim, it has taken a while to get through all of the trim because Stefan is making all of the trim out of leftover siding. There is a lot of leftover siding, which is ironic since I thought ironic since I was convinced in December that I was going to be really short on siding and that I would have to order a great deal more. Making all of the trim is not the fastest process. Stefan cuts the pieces to a rough size, cutting off the groove edge and removing the tongue, cutting the siding to width on the table saw, adding chamfers either with the hand plane, the mitre saw or the table saw depending on the chamfer. The trim then gets sanded on all sides that are exposed, this was my job, the ¼ palm sander and I are very good friends now. Once the trim is sanded, if it’s not already cut to the exact size, the trim is cut to size and installed. The windows were pretty straightforward, with the exception of chamfers, there are no angled cuts on the window trim. The trim for the edges of the dormers and between the dormer walls and ceiling needed angled cuts, so there was a lot of cut, check the trim in place and repeat until it’s installed. The trim in place along the top angled edge of the dormer. 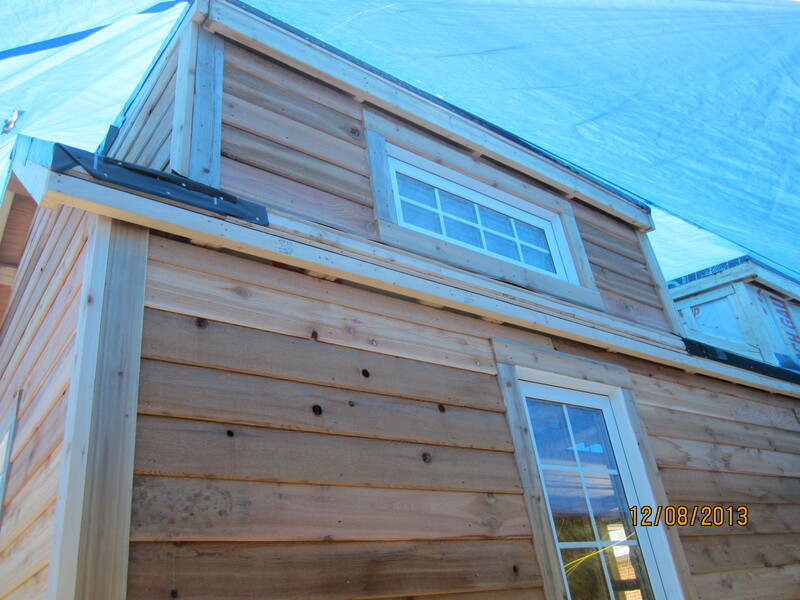 All of the trim has been custom made for Tiny Refuge using leftover siding. Where the ridge beam meets the wall before trim. The trim where the ridge beam meets the wall in place in the main loft. The main loft with all of it’s trim in place. The light isn’t great in this photo, but if you look carefully you can see the trim is in place between the dormer wall and the ceiling. Sunday morning we finished the last pieces of trim until the floor goes in. The bathroom wall was built and sided fairly quickly. Then the electrical work started. The panel was placed and as the panel is in the bathroom, I didn’t get to see much of what was going on. There were moments of banging but it was mostly quiet steady work. Every time I checked on the panel the mess that was the wires that had been sitting there since January started looking more and more organized. Order from what had looked so chaotic. There were two wires coming to the panel that I didn’t label, so they took a short bit to figure out. I labelled by wires using different coloured electrical tape. I labelled each circuit and then made a list of the circuits using the same coloured tape. Next week: more electrical and maybe some flooring! The studs going in place for the wall between the kitchen and the bathroom. We were able to use up some of the siding that had some imperfections in the sections of the wall that will be hidden by kitchen cabinets. The wires destined for the electrical panel. You can see the wires destined for the electrical panel in the bottom right of the picture after the spray foam went in. My breaker panel. I am bought a 60 amp panel and am swapping out the 60 amp breaker for a 50 amp breaker. The panel isn’t completely wired yet, but it is getting there. For those who are interested, a front view of the panel. Outlets dangling from the wall. An outlet all wired and in place. There are more than a few outlets in this house. More than 20, which is a lot for such a small space. With the spray foam insulation adding an outlet later on becomes really complicated.